An Achilles tendonitis injury is prevalent among athletes and soccer players. It happens over 250,000 times each year in the United States alone. It can have a long recovery time if you don’t treat it right. Fortunately, there is a way to relieve your pain. Even if you have calcification or a bone spur in your Achilles tendon your pain can go away. But more about that later. First I’ll tell you what the Achilles tendon is, what his function is and how you can stretch your Achilles tendon to relief your pain fast. I’ll describe all the stretching exercises in detail, including videos. This way you’ll be sure that you are performing them correctly. I’ll also explain the other treatment options you have for treating your Achilles tendonitis injury. What is an Achilles tendonitis? 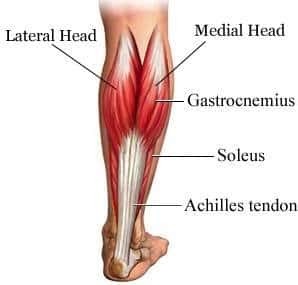 The Achilles tendon is the tendon that connects your calf muscles with your heel bone in your foot. It’s by far the strongest tendon in your body and almost impossible to tear. The function of your Achilles tendon is to transfer the forces produced by your calf muscle to your foot. It doesn’t apply any power by itself. The central movement it assists is plantar flexion of your foot. Plantar flexion is the movement where you push your foot towards the ground. That means that every time you stand on your toes, for example during walking, your calf muscles contract to pull on your Achilles tendon. When everything in your lower leg and foot works correctly, this is not a problem. Your Achilles tendon is strong enough to withstand these forces. But when the power is too high, due to an accident, overuse or any other cause, your Achilles tendon can start to get damaged and irritated. Now you’ve developed an Achilles tendonitis. This inflammation process is prevalent and happens anywhere in your body where there is damage. For your Achilles tendon, different things can cause this damage. Overuse of the Achilles tendon causes an Achilles tendonitis. When you run often, there are a lot of forces working on your Achilles tendon. These forces create microtraumas that usually are repaired by your body when it rests. But when you don’t take enough rest between your training sessions, these trauma’s don’t fully recover. Also when you run much longer than you usually do your Achilles tendon can become overused causing the same effect. Overuse without enough in between recovery causes more significant trauma of your Achilles tendon. It creates small ruptures within the tendon. When this happens, the inflammation process increases. 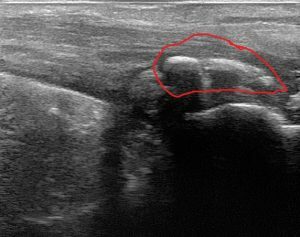 These ruptures are very well visible on an ultrasound image, like the one below. On the left picture you can see a normal Achilles tendon, and on the right image, you can see an Achilles tendonitis. You can see that the tendon on the right is thicker than on the left. but overuse of your Achilles tendon is not the only thing that can cause an Achilles tendonitis. Also, a stiff ankle or short calf muscles can cause this problem. I’ll show you how. Also, reduced mobility of your ankle and your heel bone, in particular, can cause an Achilles tendonitis. The increased force causes overuse of your Achilles tendon leading to irritation or damage to your Achilles tendon. Also, shortening of your calf muscles can cause Achilles tendonitis. When your calf muscles are too short, they pull harder on your Achilles tendon. The pulling can cause overuse and eventually damage. The damage happens because your Achilles tendon doesn’t receive the rest he needs to recover. When you give it the proper treatment, the swelling will disappear, and the Achilles tendon will go back to its original size. But when the tendinitis stays too long, fluid will appear around the tendon and in the bursa behind the Achilles tendon. The function of this fluid is to protect the Achilles tendon and to reduce the pressure. This fluid contains calcium which is essential for the recovery. When you don’t give your Achilles tendon the rest it needs, this calcium can stick together causing little blocks of calcium, called calcifications. The calcification could be a problem because it tends to reduce the function of your Achilles tendon. So when this happens, it can slow down your recovery. Fortunately, calcification of the tendon doesn’t always have to be a cause for pain or dysfunction. The woman I made this ultrasound image of, had the same calcification on her other Achilles tendon. But this side she didn’t experience any pain. Even long existing Achilles tendonitis can become pain-free. Long lasting Achilles tendonitis is also known to cause plantar fasciitis. So now you know what causes an Achilles tendonitis, it’s time to start with the proper treatment. So when you have confirmed that you suffer from Achilles tendonitis, it’s time to start your treatment right away. The first thing you should do is reduce your activities as much as possible. That means no running for a few weeks and walk as little as possible. Bike riding, however, is not a problem. Also wearing proper shoes, like hiking shoes, can help a great deal. The shoes you shouldn’t wear are high heel, sandals or flip-flops. They don’t provide proper support and won’t reduce the overuse of your Achilles tendon. Along with rest, we have to cure the causes for your Achilles tendonitis as discussed earlier. The treatment focuses on removing the possible causes of your Achilles tendonitis. That’s why the treatment consists of two stretching exercises, one mobility exercise, and one strength exercise. These are all exercises you can do at home without any equipment. You can also wear a night splint to stretch your Achilles tendon during the night. The relaxation of your Achilles tendon will make it easier to start in the morning and will help your recovery. 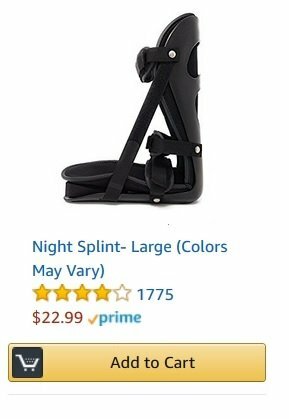 I would recommend this night splint because it puts a significant amount of pressure while letting you sleep comfortably. When this home treatment doesn’t work for you, I’ll also discuss all the other options you have to cure this pain. Achilles tendonitis stretching exercise 1: Achilles tendon stretches. The first Achilles tendonitis stretching exercise is designed to stretch your Achilles tendon. By stretching your Achilles tendon, you can reduce the pressure applied to your Achilles tendon. Reducing the stress will give it rest and the possibility to recover. You can find the exercise also in the following YouTube video. This way you know how to perform it correctly. The second tendonitis stretching exercise is designed to stretch your calf muscle. As you know by now, your calf muscle influences your Achilles tendon. By increasing its size, you’ll reduce the forces it applies to your Achilles tendon. Stand in the same position as during the first exercise. Together with stretching your Achilles tendon and calf muscles, you can reduce the pressure on your Achilles tendon even further by increasing the movement of your ankle. That’s what we will do with this next exercise. When the tension on your Achilles tendon reduces through these exercises, and the pain reduces, it’s time to start training. By training the strength of your Achilles tendon and calf muscle you will support the healing process, which will reduce your recovery time. You can find the training also in the following YouTube video. This way you know how to perform it correctly. It’s important not to start too soon with this exercise. If the conditions are not right yet, it will increase pain rather than reduce it. It might cause a little pain during the activity, but it shouldn’t cause more pain when you’re finished. Also, you shouldn’t feel a reaction later in the day. This way you know your Achilles tendon is healthy enough for this exercise. Now you can slowly try to increase it. You can do this by repeating it 15 or even 20 times. Later, when it’s going well, you can also try to perform the exercise on one leg. When you’re able to do this, you know that your Achilles tendon is almost completely healed. With these exercises, most people will be able to recover completely within eight weeks. However, some need more help. I’ll discuss your options now. If these exercises didn’t work enough for you, there are a few alternatives that can help you. These options also aim to reduce the causes of your Achilles tendonitis. The first thing you should do is to visit a physical therapist nearby. He can help you through massage or Dry Needling to reduce the tension in your calf muscle. Reducing the pressure will reduce the forces on your Achilles tendon. He can also increase the mobility of your heel bone by mobilizing it. Extra mobilization will be more effective than the exercise and sometimes necessary to loosen your ankle joint. When regular physical therapy also didn’t help you enough, shockwave therapy might be beneficial for you. The purpose of shockwave therapy is to remove the calcification in your Achilles tendon. As you know, calcification can be a cause of Achilles tendonitis, but it can also be asymptomatic. However, when all options have failed so far, it’s time to address the calcification. When the calcification is not too robust, Shockwave therapy can soften it and sometimes even crush it. This way it will fall apart and reabsorbed by your body. The treatment is relatively painful, and no success can be guaranteed. Your last resort should be surgery. If everything has failed so far and you’re still in substantial pain, you can consider surgery. During the surgery, the surgeon will remove any damaged tissue, calcification or bone spurs. He will make sure that tendon is clean again after the surgery. Unfortunately, there is no 100% guaranteed success that you will be pain-free after surgery. Also, the recovery time can take up to several months before you’ll be able to do everything you want. I’ve described several treatment options for Achilles tendonitis. You should be able now to make the right decision about your best treatment options. If you still have any questions, feel free to send me an e-mail at [email protected].